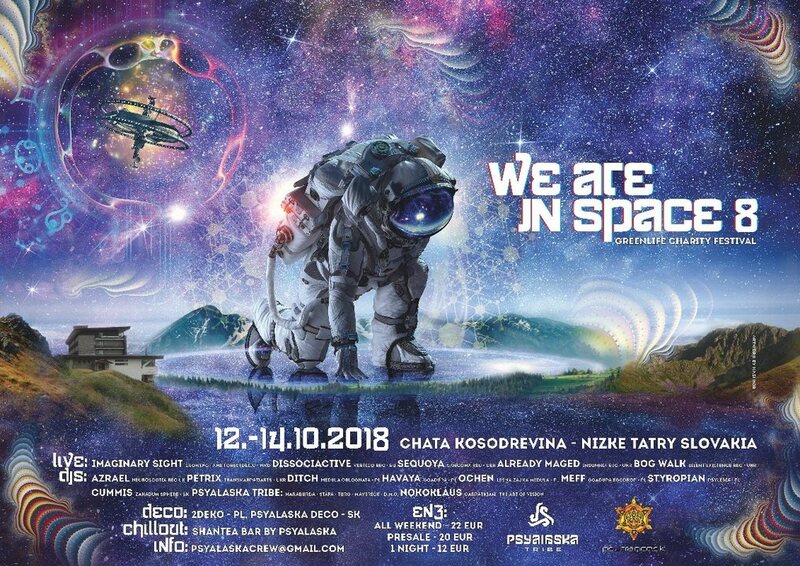 Srdecene vas pozyvame na osme pokračovanie uspešneho weekendoveho mini festivalu WE ARE IN SPACE na legendarnej chate KOSODREVINA-NIZKE TATRY V termine cez babie leto 12-14.10.2018. Tento rok sme sa rozhodli venovat cast zo vstupneho na podporu ceskoslovenskeho projektu prales detom na zachranu daždoveho pralesu na Sumatre, z vyzbiernych peniazkou kupime cast pralesa ktory uz nikdy nebude mozne vyrubat. Viac informacii o projekte najdete na [pralesdetem.cz]. Možete sa tešiť na dve podia s množstvom zahraničnych aj domacich interpretov. Nebude chybat velky chillout alternative stage s čajovnou SHANTEA BAR. K dispozicii budu dva bary, jedalen s dennym menu, množstvo obchodikov. We warmly invite you to join us at mountain Cottage KOSODREVINA (Low Tatras) for the eight installment of the successful weekend minifestival WE ARE IN SPACE. You can look forward to two stages with a variety of international and local acts.. Naturally you can also expect a big chillout-alternative floor area with the SHANTEA BAR chai shop. Other attractions include two bars a canteen with daily specials, lots of stalls, stunning decorations, and gorgeous projections. Accommodation is available on-site at Chalet Kosodrevina in 2,3,4,5,or 6 bed roorms. Arrive by cable car, or enjoy the short walk with beautiful views of the Low Tatras. !!!!! ROOM INFOS and bookings are avalaible from 1.st of AUGUST.!!!!! •●ૐ●• IMAGINARY SIGHT-Glowing Flame/Forestdelic rec - MACEDONIA 1st time in Slovakia-Live ! Imaginary Sight is Marko Daravelski from Macedonia. He is the founder and label manager of Glowing Flame Records. He has been active in the scene since the early days and began by promoting parties/events and as a DJ. Around the time his vision began to develop he was also drawn to producing music.After couple of years experimenting in the sound-lab the Imaginary Sight Sound was born. The sound is mystic psychedelic with euphoric melodies for mornings and deep, atmospheric deviant vibes for the nights. Marko has played with many names of the scene and almost every psy nation around such as Japan, India,Brazil, UK and the whole Europe. •●ૐ●• DISSOCIACTIVE- Vertigo rec - RUSSIA-Live !!! Dissociactive project was started by Slavik Iskanyan in the year 2001. First intresting things happen in 2003 when respected Israeli label DooF Records had released results of two sonic experiments under the code names: Fabrikikoz and Lakrimoza. Slavik’s laboratory assistant at that time was Varik Gleb, with whom they worked closely for about 2 years. Same time guys was discovered by guru of the psychedelic world Alex Parasense, who played a key role in the project destiny. They started to perform at most Parasense family parties around Moscow. •●ૐ●• SEQUOYA-Sangoma Rec - GERMANY 1st time in Slovakia Live !!! Sequoya is the project of Yan Krassowski, born in 1979 in Darmstadt, Germany. His love and passion for electronic music started back in the mid 90`s with the young age of 15, where he discovered the local techno scene. Early influences where DJ`s like Sven Väth or DJ Dag and first experiences in technoclubs, like the legendary Omen or Dorian Gray in Frankfurt a.M.
2012 the Sequoya project was born. The debut EP “Nomad” came out in 2013 on BMSS Records, 2015 the “Singularity EP” on Sangoma, followed by tracks on different Compilations and Labels. His music can be described as deep, flowing forest psy with a unique style of storytelling and remarkable sounddesign. While starting to play his Liveset around the world, Yan still loves to DJ as well- telling deep, twisted and rocking musical stories. •●ૐ●• ALREADY MAGED - Insomnia rec - UKRAINE 1st time in Slovakia Live !!! •●ૐ●• BOG WALK - Silent Existence Rec - UKRAINE 1st time in Slovakia Live !!! Azrael is a wild psychedelic trance entity - drawn from a fiery crucible of 4/4 beats in the early days of the universe, he was raised by lions in the Sahara desert over a period of 3000 years, and emerged into the modern world following the heavenly appearance of a great comet in the sky. Confused by technology, he chanelled electronic sound through the 4/4 beat of his heart and unleashed mind melting psychedelic trance upon the unsuspecting souls of this earth.